How we are making Django more accessible and collaborative, for everyone! Over the last months, we have been working on one of our biggest updates yet. We set ourselves the challenge of creating the most affordable flat-rate service to build and run professional Django applications. At the same time, we wanted to create something that included everything required to run a high performance website - no hidden extras or limitations. With this update, we introduce a streamlined Divio platform with big upgrades and new pricing! If you're an existing Divio user then you might already know we have a free plan.. so what could be better than free ? 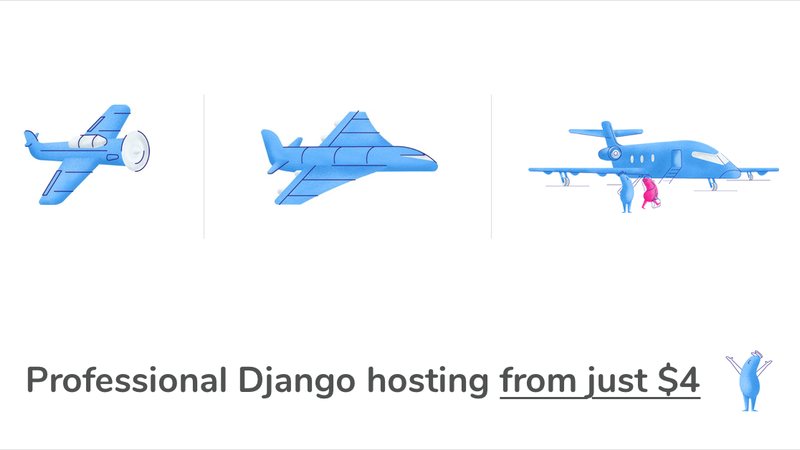 Our free plan was ideal for learners and hobbyists looking to find their feet with Django But, by design, it was not intended to be used for more demanding projects. An inherent limitation was, for example, going to a sleeping state after 15 minutes of no activity and no backup scheduling. The next step-up from free was the $9 Personal plan. The Personal plan was an intermediate between hobbyist and professional, with a balance of power and cost to make it viable for a professional and yet still low-cost project. A Postgres database was included together with a domain name, plenty of disk space, memory and backups. In other words, it met the needs for most website projects where critical reliability was not a key consideration. At this point you might notice the word “was” - as of today, we are retiring our old plans. Whilst these plans are no longer available for new projects, they will live on for existing projects to avoid any action needing to be taken. If you have a project using an old price plan then simply carry on - no changes required! First of all - a refined and refreshed free plan is back. Our free plan has a tremendous uptake and we consider it an important part of our contribution to a healthy and growing Django developer ecosystem. The free plan will continue to enable and encourage Django newcomers and especially users in developing countries, to deploy a real Django site and be able to learn and explore Django without ever needing to pay anything. Upgrading from free to our paid plans has been greatly simplified from the existing 5 choices to just 2 - Economy and Business. We have replaced fixed specification choices and instead introduced fully customisable plans - you can fine tune everything within your plan to your exact project needs. Better yet, you can also fine tune as you go to reflect your project needs as they grow. With the introduction of the new base paid plans, comes a big upgrade in specifications to cater for a wider range of project demands. If you are entirely new to cloud based services, you might well wonder what an "instance" or "object storage" is all about whilst more familiar terms, such as "CPU" and "disk space", are no longer relevant. An "instance" you can think of as a unit of computing power which is calculated by slicing up all the available processing power of the cloud into units or instances. Given cloud computing resources are ever-changing, depending on demand, it's not a fixed value as your desktop CPU might be measured in. The more instances you have, the more computing power units are allocated. Moreover, the more instances that are available, the more resilience you have where there is inherent fail-over and load balancing - if one instance fails, others can take over and distribute the workload accordingly . "Object storage" can be loosely thought of as "disk space but in the cloud". Traditionally disk space would refer to local storage - how much hard disk space you have. In the cloud, everything is an object - a video file, a css file or a webpage are all objects. The more object space you have available, the more space you have to store your project assets. You can influence physically where the objects are stored through choosing a specific regional data center. Our Economy plan is designed to make the Divio platform accessible for all users, with low startup pricing and the ability to grow to support professional sites. Economy plans are a great way to get started and scale up with the right mix of powerful features and reliability. With the introduction of the Economy plan, we are introducing what we think might be an industry first $4 price plan - including a Postgres database, ample memory and storage, domain name hosting, SSL certificate and scheduled backups. In other words, everything you need to create and run a professional site with no extra costs for adding a database or other basics. From the base $4 price plan you can further scale up your features with additional domains, worker instances, storage and transfer quota. The Divio developer tools are, of course, included which make creating and deploying Django projects as easy as a button-press or accessible through the Divio CLI command line tool if you favour working from the terminal. The Business plan takes all the features of the economy plan and adds an important upgrade - high-availability. High availability is achieved through a mix of infrastructure design and backups. The business infrastructure is designed with failover in mind where, in the event of a serious issue, your application is seamlessly and silently shifted away from the issue until it can be corrected. Divio engineers pro-actively monitor the infrastructure and when an issue occurs, diagnose and fix the problem directly. Business plans start from $125 and in addition to high-availability infrastructure, come with more extensive backup coverage allowing for roll-back of issues and quicker stress-free disaster recovery. You can use scheduled or custom backups as needed with a custom retention period for the backed up data. Business plans also allow for a choice of data-centre - a must-have if keeping data in a very specific location is important for your business needs. You can also take advantage of different compliance and features offered by the different data centers. Together with the new business plan, we are introducing a Premium upgrade which enables more features and critical incident support. The Premium upgrade comes in a choice of 4 different levels to suit your project needs with a custom plan possible. It is an ideal and natural upgrade for larger companies serving a global audience. Critical incident support provides a guaranteed 30 minute response time 24/7, regardless of time zone and through a dedicated phone number. Further, new features include the ability to have an isolated cluster - a cloud dedicated entirely to your project and tight-knit integration with existing login systems through the flexible SAML markup protocol. In order to help you get the most out of Premium, an online technical on-boarding can be setup. Our experts prepare and tailor the introduction to the needs and interests of your team to ensure you get a smooth start. Show me the GBs, TBs and Mhz! The new plans and specific customisation options are now available in a refreshed and updated Divio Control Panel. Based upon your feedback, we have re-designed the Divio Control Panel to balance ease-of-use against making all configuration options more easily accessible. You can now build your own custom configuration and tweak to your budget and project needs. One of our most popular features is the ability to add collaborators to projects. Each collaborator is assigned a role and can then join a project and work together with other collaborators towards the project goals. In order to stay organised, change management is handled by Git. Our new plans introduce unlimited free collaborators - even free plans can add collaborators at no extra cost. Together with your preferred tools for managing feature priorities, entire teams can now work together with a complete overview of changes being made. Ready to get started ? the refreshed Control Panel is available now so you can jump in directly. Still not sure if Divio is right for you ? our new really simple plan calculator makes exploring different configurations easy - no account required and no Googling to make sense of it!